Would You Live in a House of Bricks Made from Pee and Bacteria? To make a concrete bench, add sand, bacteria, calcium chloride, and some really concentrated pee? When we first saw Peter Trimble's sand and urea bio-furniture—the latter is a chemical most commonly found in pee—we were excited to see human urine put to yet another green use. So we were slightly disappointed to learn that, no, Peter Trimble did not in fact spend weeks or months collecting his urine. 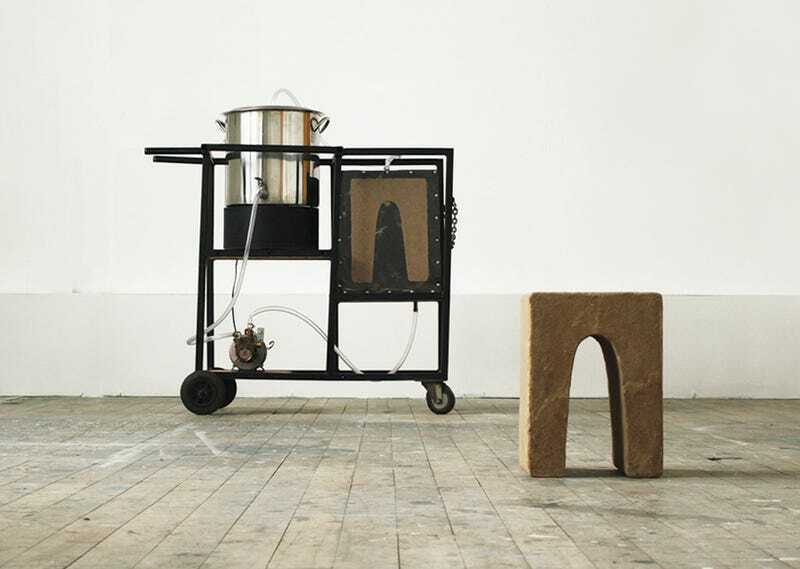 This stool is made from sand, bacteria, and pure urea. But, but! The process is technically possible, and that in itself is a rather fascinating example of what bacteria can do. Urine-inspired, environmentally friendly biobricks first grabbed our attention back in 2010, when American architecture professor Ginger Krieg Dosier came up with an idea for taking advantage of bacteria's unique capabilities. The microbes metabolize the mixture of sand, urea, and calcium chloride, creating a glue that strongly binds the sand molecules together. Dosier has since created company called bioMason to manufacture the bricks. The key advantage of these bricks is that they don't have to be fired in a kiln. In contrast, the manufacture of traditional bricks—multiplied over millions of bricks—causes major pollution. These bio-bricks do have an environmental downside, however: the same bacterial metabolism turns the urea into ammonia, which can poison the groundwater. That brings us to Mars.